This afternoon a friend and I co-hosted our Baha’i community’s celebration of the Twelfth Day of Ridvan. We worked together to create a short program with music, readings, and a story for children about Baha’u’llah‘s stay in the Ridvan Garden. 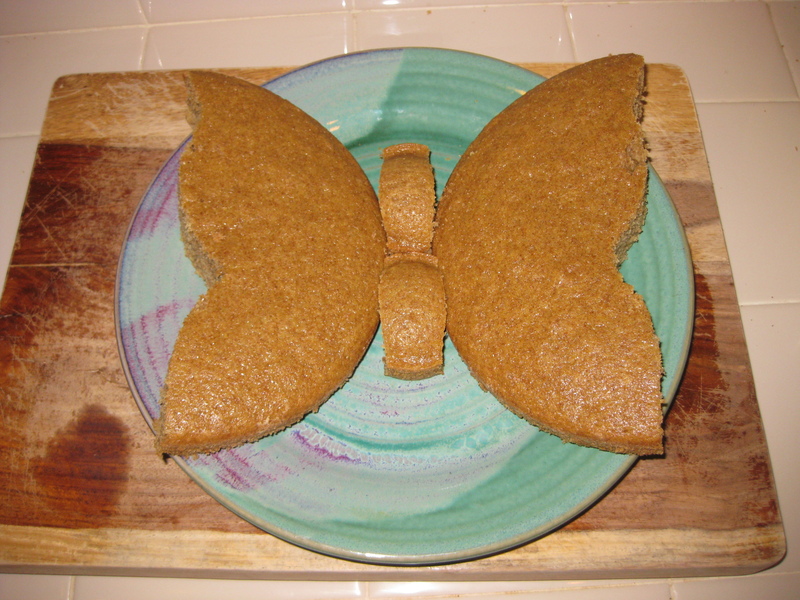 While my friend provided most of the refreshments, I offered to bake a treat that I remembered from my own childhood – a butterfly cake. I borrowed a recipe for a vanilla cake (vegan!) 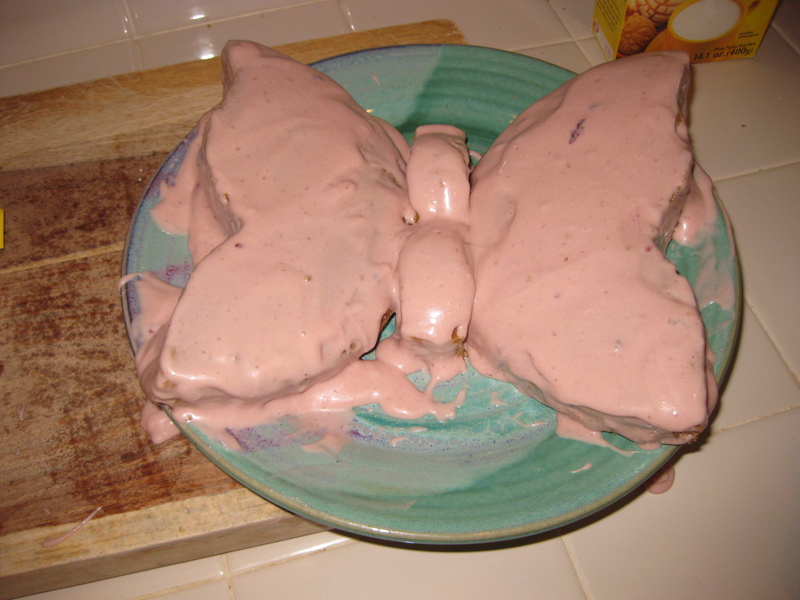 with cream cheese frosting from my sister and started trolling the internet for ideas on how to make a butterfly-shaped cake. While my own mother’s method used a 9 x 13 sheet pan, I wasn’t sure the pan I had would work. 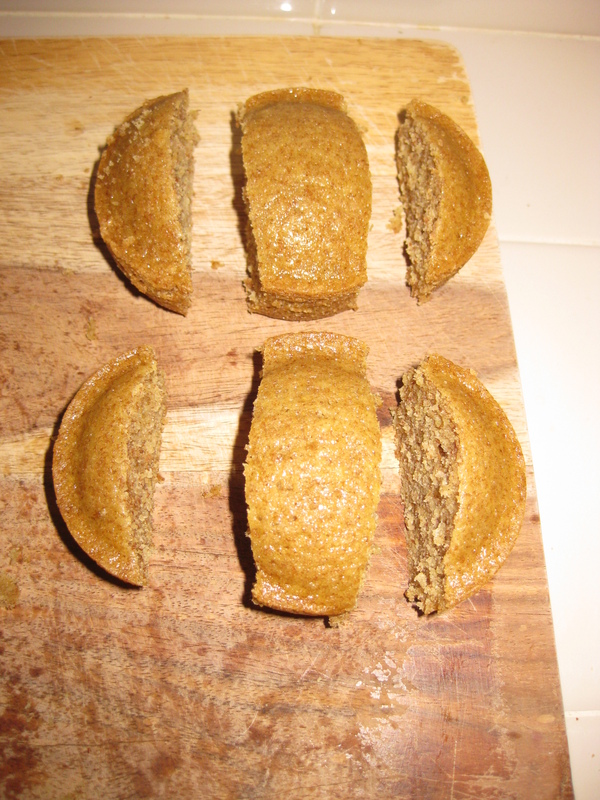 So instead, I opted to do a healthier version of this cake, which utilizes a simple round baking pan. Since this would result in a rather small, one layer cake, I decided to double the recipe and make cupcakes as well. My dear sister suggested that I turn the cupcakes into ladybugs, a suggestion I nearly dismissed out of hand, since that seemed a little too, well, out-of-the-box creative for someone like me, who likes to follow tutorials and recipes line by line. Luckily, she persuaded me, and after a bit of experimentation, the results were quite lovely! First to be tackled was the cake itself. 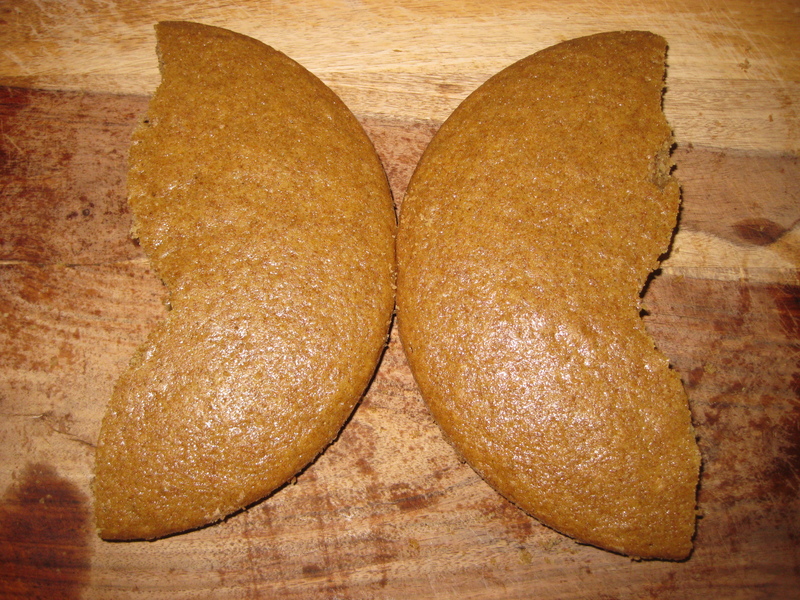 After the cake had completed cooled, I cut it in half and reversed the halves, so that the two semi-circles were facing away from each other. Per the tutorial, I carved a notch in each and shaped them a bit so they looked more like wings. Now I just needed to find a replacement for the candy used in the tutorial for the body, since I thought the cake would be sweet enough without it. The extra cupcakes came in handy here – I just cut the sides off two of them and lined them up between the wings to form the body. Now it was really looking like a butterfly! Finally, it was time to make the frosting. I was adamant about avoiding artificial food coloring, so I did some research about natural food dyes. This post is a great guide to using natural foods to create dyes for Easter eggs and for frosting cakes. I had a bag of frozen berries, so I decided to do a pink/purple color, using the juice from mashed blueberries and blackberries. The only problem is that the post uses a specific frosting recipe, so that the extra juice from the berries doesn’t create a frosting that is too runny. Since I was using my own recipe, however, I wasn’t quite sure how to modify it to avoid this, and so even though I did not use very much juice (hence the light color), I was still left with frosting that ran right off the cake. I know you are distracted by all that runny frosting – but look at the beautiful platter my cousin made for us! The frosting was already so sweet that I didn’t want to add more powdered sugar, which I knew would thicken it up, so instead I used one of the ingredients in powdered sugar – cornstarch! It didn’t change the flavor at all and did help with the consistency. Still, in the end, I had to put the whole thing in the refrigerator for about an hour before I could finish frosting it, and even then the strawberry slices I added as a final decoration tended to slide off the cake. I still was pleased with the final results, although next time I will tinker a bit more with the recipe to make frosting easier. From this post I got the idea to use beetroot powder for the red coloring for my cupcake frosting. After doing a little more research into how to use it in frosting and baking, I was ready to get started. 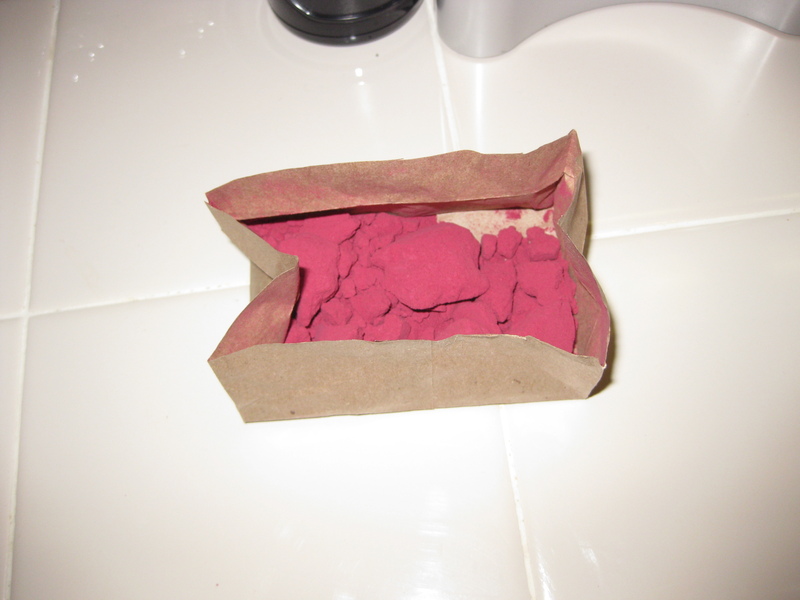 (If you’re not sure where to get beetroot powder, check the bulk bins at your local coop). The powder was much easier to work with than the berry juice had been and gave me a frosting with the perfect consistency. 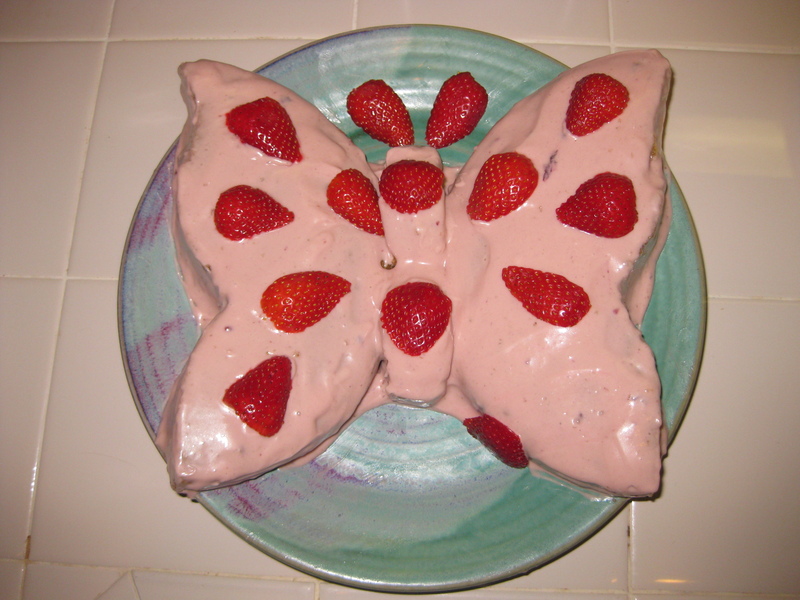 Next time I may just go with this for the butterfly cake as well! As for the rest of the decorations, I was really on my own, since the many tutorials and photos I found for ladybug cupcakes used candy and other artificial ingredients. 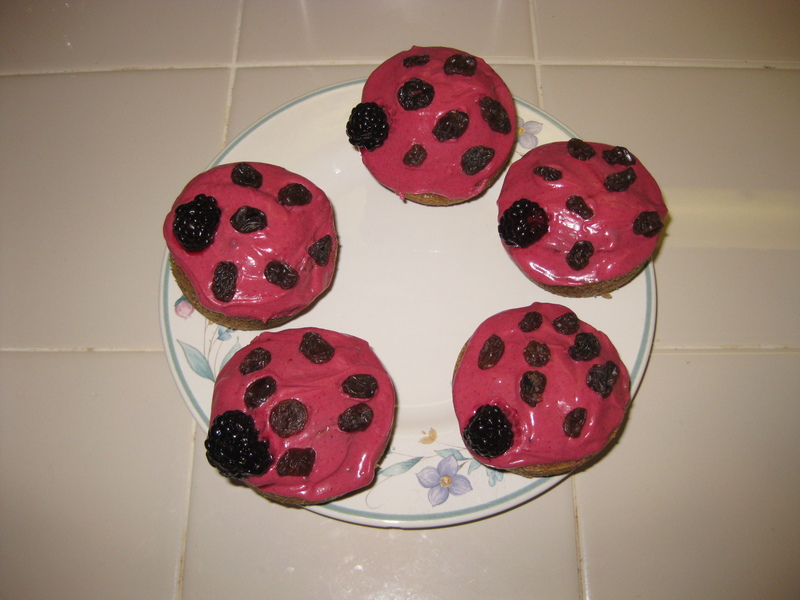 For the spots, I opted for raisins, and, at my sister’s suggestion, used blackberries for the ladybug heads. They were adorable! I just wish I had had fresh blackberries on hand: although I drained the frozen berries as they were defrosting, they still had a bit of trouble staying in place because they were so much squishier than the fresh ones would have been. So, many lessons learned! Watch out, community: when next Ridvan comes around, a new and improved butterfly cake and her ladybug friends may make another appearance! Many thanks to my mother and sister for their consultations on these recipes!